Also at issue was the anticipation of the claim limitation “caddies” which the Federal Circuit found was first identified in the reference during the oral argument before the Board. The Federal Circuit vacated the finding of anticipation because the Board denied the patent owner notice and a fair opportunity to respond to this basis of cancellation. The Federal Circuit explained that a patent owner is undoubtedly entitled to notice of and a fair opportunity to meet the grounds of rejection. The Federal Circuit said that for a formal adjudication like the inter partes, the APA imposes particular requirements on the PTO. The agency must timely inform the patent owner of the matters of fact and law asserted (5 U.S.C. § 554(b)(3)), must provide all interested parties opportunity for the submission and consideration of facts and arguments and hearing and decision on notice, (5 U.S.C. § 554(c)), and must allow a party to submit rebuttal evidence as may be required for a full and true disclosure of the facts, (5 U.S.C. § 556(d)). The Federal Circuit noted that the PTO has advised participants in its Board proceedings that, at oral argument, a party may only present arguments relied upon in the papers previously submitted, and that no new evidence or arguments may be presented at the oral argument. However, the Federal Circuit found that the Board denied the patent owner its procedural rights by relying in its decision on a factual assertion introduced into the proceeding only at oral argument, after the patent owner could meaningfully respond. “Comprising” means that the claim can be met by a system that contains features over and above those specifically required by the claim element, but only if the system still satisfies the specific claim-element requirements: the claim does not cover systems whose unclaimed features make the claim elements no longer satisfied. The Federal Circuit also noted that the Board cited the indefinite article “a” before “statistical analysis request” to support its interpretation. However the Federal Circuit said that while “a” sometimes is non-restrictive as to number, permitting the presence of more than one of the objects following that indefinite article, context matters even as to whether the word has that meaning. The Federal Circuit said the question is not whether there can be more than one request in a claim-covered system: there can. Rather, the question was whether “a” can serve to negate what is required by the language following “a”: a “request” (a singular term) that “correspond[s]” to “two or more selected investments.” The Federal Circuti said that it cannot. The Federal Circuit observed “For a dog owner to have ‘a dog that rolls over and fetches sticks,’ it does not suffice that he have two dogs, each able to perform just one of the tasks. The Federal Circuit held that the Board applied an unreasonably broad interpretation, and remanded the applications to be reconsidered in light of the proper claim construction. In Ultimatepointer LLC v. Nintendo Co., Ltd.,  (March 1, 2016), the Federal Circuit affirmed summary judgment of non-infringement of U.S. Patent No. U.S. Patent 8,049,729 on a handheld pointing device. At issue was whether the claims to a pointing device were covered the accused indirect pointing device, or were limited to direct pointing devices. i.e. devices for which the physical point-of-aim coincides with the item being pointed at. The district court found that the claims were limited to direct pointing devices, and thus were not infringed, and the Federal Circuit agreed. The Federal Circuit balanced the rule against importing limitations from the specification into the claims, with the fact that repeated criticisms often indicate that subject matter was not intended to be within the scope of the claims. We have cautioned against importing limitations from the specification into the claims when performing claim construction, Innogenetics, N.V. v. Abbott Labs., 512 F.3d 1363, 1370 (Fed. Cir. 2008); however, we have also recognized that “repeated derogatory statements” can indicate that the criticized technologies were not intended to be within the scope of the claims, Chicago Bd. Options Exch. v. Int’l Sec. Exch., 677 F.3d 1361, 1372 (Fed. Cir. 2012). The Federal Circuit noted that he specification repeatedly emphasizes that the invention is directed to a direct-pointing system, and repeatedly called the hand held device a direct pointing device. The Federal Circuit even pointed to the title, “Easily-Deployable Interactive Direct Pointing System . . .” as indicating that the invention is limited to direct pointing systems, citing Exxon Chem. Patents, Inc. v. Lubrizol Corp., 64 F.3d 1553, 1557 (Fed. Cir. 1995). 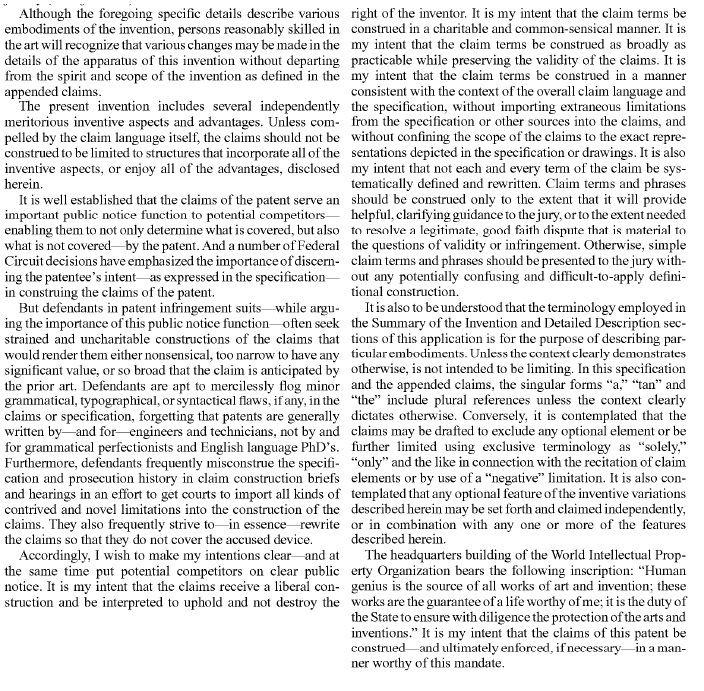 The Federal Circuit also noted that the specification emphasized how direct pointing was superior to indirect pointing, and conversely how the written description disparaged indirect pointing. The Federal Circuit said that taken together, the repeated description of the invention as a direct-pointing system, the repeated extolling of the virtues of direct pointing, and the repeated criticism of indirect pointing clearly point to the conclusion that the “handheld device” in the claims was limited to a direct-pointing device. In Trivascular, Inc., v. Samuels, [2015-1631) (February 5, 2015), the Federal Circuit affirmed a rare PTAB determination in an IPR that the claims of U.S. Patent No. 6,007,575 were not shown to be invalid. The claims were directed to stents with an inflatable cuff for securing the stent in a blood vessel. TriVascular argued that the Board erred in construing “circumferential ridges” to mean a “raised strip disposed circumferentially about the outer surface of the inflatable cuff,” contending that it should have been construed to mean “an elevated part of the outer surface disposed about the inflatable cuff that can be either continuous or discontinuous.” The Federal Circuit found that TriVascular’s proposed interpretation was unreasonably broad, and that find the Board’s reliance on the dictionary definition of ridge when considered in the context of the written description and plain language of the claims was proper. TriVascular further argued that the Board should have applied prosecution history disclaimer, and found that Samuels had disclaimed the narrower construction that the ridges must be continuous. The Federal Circuit said that the same general tenets that apply to prosecution history estoppel apply to prosecution history disclaimer. Both doctrines require that the claims of a patent be interpreted in light of the proceedings in the PTO during the application process. As applied to a disclaimer analysis, “the prosecution history can often inform the meaning of the claim language by demonstrating how the inventor understood the invention.” Disclaimer “ensures that claims are interpreted by reference to those that have been cancelled or rejected, but the party seeking to invoke prosecution history disclaimer bears the burden of proving the existence of a “clear and unmistakable” disclaimer that would have been evident to one skilled in the art. TriVascular argued that the disclaimer arose when Samuels amended the claims to recite “continuously circumferential ridges,” but the claims that were later allowed did not have this requirement, but instead had other limitations defining over the prior art. However the Federal Circuit did not find this sufficient to work a clear and unmistakable disclaimer. 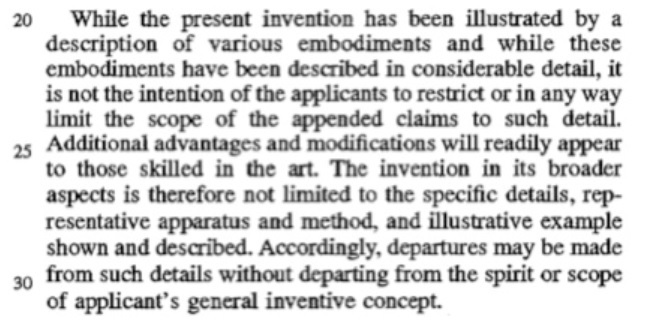 Regarding obviousness, the Federal Circuit noted that Although the KSR test is flexible, the Board must still be careful not to allow hindsight reconstruction of references without any explanation as to how or why the references would be combined to produce the claimed invention. The Federal Circuit found that the Board’s findings that a skilled artisan would neither have had the motivation to combine nor a reasonable likelihood of success in combining the references were supported by substantial evidence, and supported the Board’s conclusion on nonobviousness. the Board is not bound by any findings made in its Institution Decision. At that point, the Board is considering the matter preliminarily without the benefit of a full record. The Board is free to change its view of the merits after further development of the record, and should do so if convinced its initial inclinations were wrong. To conclude otherwise would collapse these two very different analyses into one, which we decline to do. The Federal Circuit added that TriVascular’s argument also fails to appreciate that there is a significant difference between a petitioner’s burden to establish a “reasonable likelihood of success” at institution, and actually proving invalidity by a preponderance of the evidence at trial. A Beauregard claim is a claim to a computer program written as a claim to an article of manufacture: a computer-readable medium on which instructions are encoded for carrying out a process. Beauregard appealed the rejection of his claims directed to software on a tangible storage medium. The Court never approved this method of claiming software, because the Commissioner of Patents conceded that “that computer programs embodied in a tangible medium, such as floppy diskettes, are patentable subject matter under 35 U.S.C. § 101 and must be examined under 35 U.S.C. § 102 and 103,” and dismissed the appeal In re Beauregard, 53 F.3d 1583 (Fed. Cir. 1995). This worked well until In re Nuijten, 500 F.3d 1346 (Fed. Cir. 2007), where the Federal Circuit held that signals were not patent eligible, because their ephemeral nature kept them from falling within the statutory categories of 35 U.S.C. § 101. This undermined Beauregard claims to computer programs electronically distributed. In 2010, the USPTO advised applicants that, to avoid running afoul of In re Nuijten, software claims should be directed to non-transitory computer-readable media. Generally speaking, a computer-accessible medium may include any tangible or non-transitory storage media or memory media such as electronic, magnetic, or optical media—e.g., disk or CD/DVD-ROM coupled to computer system 400 via bus 430. The terms “tangible” and “non-transitory,” as used herein, are intended to describe a computer-readable storage medium (or “memory”) excluding propagating electromagnetic signals, but are not intended to otherwise limit the type of physical computer-readable storage device that is encompassed by the phrase computer-readable medium or memory. For instance, the terms “non-transitory computer-readable medium” or “tangible memory” are intended to encompass types of storage devices that do not necessarily store information permanently, including for example, random access memory (RAM). Program instructions and data stored on a tangible computer-accessible storage medium in non-transitory form may further be transmitted by transmission media or signals such as electrical, electromagnetic, or digital signals, which may be conveyed via a communication medium such as a network and/or a wireless link. The terms “tangible” and “non-transitory,” as used herein, are intended to describe a computer-readable storage medium (or “memory”) excluding propagating electromagnetic signals, but are not intended to otherwise limit the type of physical computer-readable storage device that is encompassed by the phrase computer-readable medium or memory. For instance, the terms “non-transitory computer readable medium” or “tangible memory” are intended to encompass types of storage devices that do not necessarily store information permanently, including for example, random access memory (RAM). Program instructions and data stored on a tangible computer-accessible storage medium in non-transitory form may further be transmitted by transmission media or signals such as electrical, electromagnetic, or digital signals, which may be conveyed via a communication medium such as a network and/or a wireless link. The term “non-transitory”, as used herein, is a limitation of the medium itself (i.e., tangible, not a signal ) as opposed to a limitation on data storage persistency (e.g., RAM vs. ROM). When claiming software stored on a computer readable medium, explaining the claim terms may be important. In Wi-Lan, Inc. v. Apple Inc., [2014-1437, 2014-1485] (Fed. Cir. 2016), the Federal Circuit reversed the trial court’s JMOL determination of no invalidity of U.S. Patent No. RE37,802 because it was based on a post-verdict reconstruction of the claims. The jury found the claims invalid, but on JMOL the trial court determined that, although its earlier construction of computing means does not specifically provide for a complex multiplier, a complex multiplier was nevertheless necessary because expert witnesses from both sides agreed that complex multiplies are part of the structure of a first computing means. Since it was undisputed that such complex multipliers are absent from the prior art, the trial court granted JMOL that the claims were not invalid. The Federal Circuit agreed with Apple that the district court’s postverdict addition of a complex multiplier requirement was a new claim construction, which the district court may not issue at the JMOL stage. The Federal Circuit said that it is too late at the JMOL stage to argue for or adopt a new and more detailed interpretation of the claim language and test the jury verdict by that new and more detailed interpretation. At the JMOL stage, the question for the trial court is limited to whether substantial evidence supports the jury’s verdict under the issued construction. The Federal Circuit rejected Wi-Lan’s argument that this was a permissible clarification, rather that impermissible reconstruction. The Federal Circuit said that a trial court may “adjust constructions post-trial if the court merely elaborates on a meaning inherent in the previous construction.” Clarification is permissible where it only makes plane what should have been obvious to the jury. The Federal Circuit said that the district court’s JMOL of no invalidity was based on a reconstruction of the claims that went far beyond clarifying a meaning inherent in the construction or making plain what should have been obvious to the jury. Instead, the post-verdict reconstruction altered the scope of the original construction and undermined Apple’s invalidity case post-verdict. In Smith v.Orbcomm. Inc. [2:14-CV-666 (E.D. Tex. 2015), Judge Gilstrap invalidated as indefinite two claims of U.S. Patent No. 6,611,686 on a system of remotely tracking vehicles and cargo, rejecting the patent owner’s argument that the claims contained a typographical error that the court had the authority to correct in view of the patent owner’s alternative construction for the erroneous claim language. The patent owner argued that the phrase “inputs to be controlled” in claims 15 and 48 contain an obvious typographical error that the court should correct to “inputs to be monitored,” explaining that the language arose from errors apparent in the prosecution. In the alternative, the patent owner proffered an interpretation for the claims as written. and 48. The district court found that in view of the patent owner’s alternate construction, this language could not be regarded as an obvious typographical error. Furthermore the court noted the patent owner’s failure to obtain a Certificate of Correction.finding the patent owner’s arguments and actions show that correction is subject to reasonable debate. and thus not correctable by the court.. In addition, the court found that the error was not evident from the face of the patent, another requirement for the court to make the correction. Stock language for advertisements and syndicated columns were cast or stamped in more durable materials such as steel for distribution and local printing. Apparently from their resemblance to the steel plates used in the construction of boilers, the plates, and eventually the stock material on them, became known as boilerplate. Eventually usage of the term “boilerplate” was applied to stock language in any document, such as contracts, and even in patents. Boilerplate sentences and paragraphs are common in patents, but does it ever really make a difference? Boilerplate can indeed make a difference, and thus it probably is good practice to include it in patent applications. For example in Hill-Rom Services, Inc. v. Stryker Corporation, —F.3d — (Fed. Cir. 2014), the Federal Circuit cited boilerplate language (although not identifying it as such) that the “description of various embodiments” is not intended “to restrict or in any way limit the scope of the appended claims to such detail” in determining that the tem “data link” was not limited to the particular wired data link described in the specification. In Northrup Grumman Corp. v. Intel Corp., 325 F.2d 1346 (Fed. Cir. 2003), the Federal Circuit rejected the district court findings and defendant’s argument that Northrup was relying upon mere boiler plate that “the present invention may be made to conform to any one of a variety of data transfer algorithms.” However the Federal Circuit did not express any opinion about boilerplate generally, but did find that the patent does not rest upon a mere “boilerplate” suggestion of broad application. It goes on to provide substantive, albeit general, support for that declared intention. The bottom line is that patent application boiler plate doesn’t seem to cause any harm, and occasionally, it has been helpful. Better, of course, would be the oxymoronic “custom boilerplate” where stock broadening statements are tailored to the current disclosure. Therefore, there is good reason to include well-thought-out “boilerplate” in an application, although it is no substitute for a well-crafted specification.